Odyssey Adventure Club members, if you’ve been awaiting the release of the new iOS app to complete your membership experience, wait no longer! The Odyssey Adventure Club app is a Focus on the Family product that puts you into the world of Odyssey. You get access to ALL of the Adventures in Odyssey episodes plus exclusive content that is only available to club members. Kids also get the opportunity to participate in web quests that take them around the world and incorporate what they learn from the episodes into fun activities. Along with the web quests, you get a documentary each month that elaborates on the real places and people behind the stories. Kids can also share their stories about how they have lived out their faith. Odyssey Adventure Club is a great way to invest in your child’s spiritual growth, and have fun while doing it. 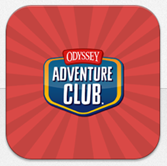 If you’re a member of the Odyssey Adventure Club, you can visit the iTunes Store to download the app. One of the key features of the app is that you can download up to five episodes for easy listening when you aren’t using a wifi connection. In other words, if you’re on a road trip, you’ll be able to stock up on episodes to your iPhone, iPod, or iPad for seamless playback. If you aren’t a member of the Odyssey Adventure Club and would like to become a member, learn more and subscribe at OAClub.org. We’re definitely entering an interesting era for Adventures in Odyssey. With over 700 episodes in the popular series, it’s never been easier to access all the episodes. If you have any questions regarding OAC, you can watch the January edition of Social Shout-Out with Brock and Evan as they answer some top questions about the club. Or you can see our original post regarding OAC for more answers.